When I was in my early- and mid-20s I read all of Tom Robbins's books. They were so unusual and I loved the quirky characters, snappy dialogue, and madcap adventures. Now Robbins has a nonfiction book about his own true-life adventures and my book group picked it to read this month. Recounting his childhood, marriages, military service, and his relationship with LSD (among other things) his voice was familiar and his stories came across as much like tall tales as his novels. It sort of felt like listening to an older relative tell stories about his life that were likely embellished to liven up a family gathering. Because it was a loose collection of stories rather than one continuous storyline, I found it a bit difficult to get into. At the same time, I read it while I was feeling generally distracted (while prepping for, and on, my trip to Russia) and that didn't help, but it was probably a good choice since I didn't need to follow any complicated story lines. Overall, I found it entertaining and funny, but I don't have much to say about it. Although I didn't read it under the best of circumstances, I don't know if I would have loved it even under ideal reading conditions. As much as I loved Tom Robbins when I was in my 20s, I'm not just sure if he's my sort of thing these days. 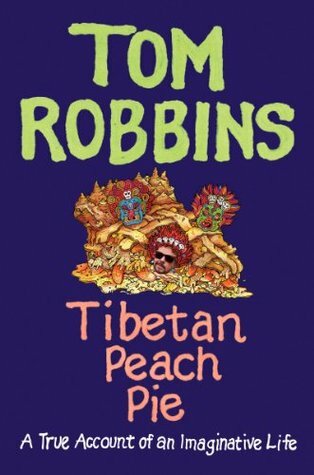 If you're a fan of Tom Robbins, you might appreciate it; if you haven't read Robbins before, I'd suggest that you try his novels first.